Last week on the CorvAIRCRAFT list we debated what happens when your OT-10 cam is retarded 4 degrees. 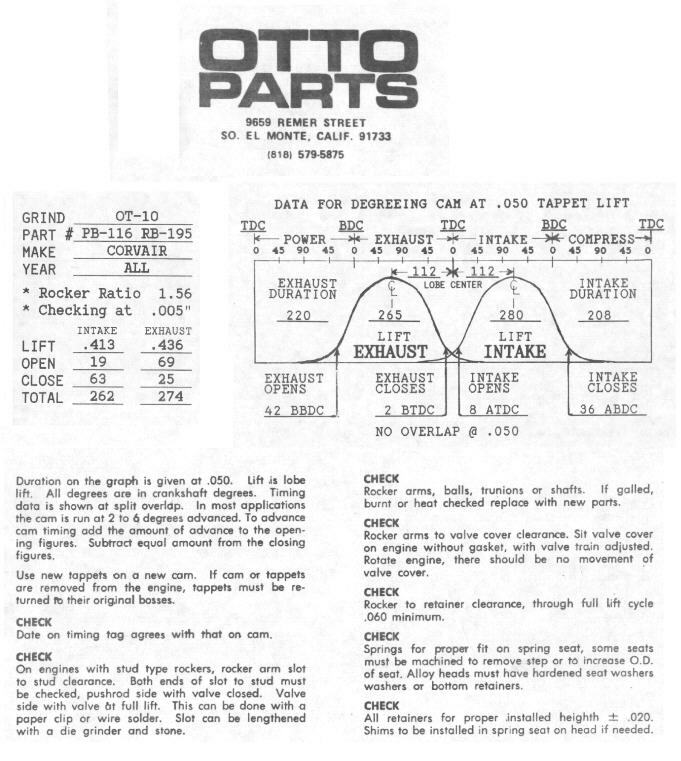 I ran the following scenarios through Dyno2000, all using the 3100cc "Big Boy" engine's parameters, which are nothing more than a stock 110hp Corvair with an OT-10 cam and increased displacement. I would expect similar results for the stock 110 engine using the OT-10, but yielding proportionally smaller numbers. Torque is green and horsepower is red. The following plots are rather informative. Cam retarded four degrees with relation to the crankshaft (and all below are from also from crankshaft). Cam neither retarded nor advanced. Cam advanced four crankshaft degrees. Cam advanced ten degrees. Torque at 3500 rpm is 194 foot pounds (the max available from advancing the cam), and hp is 129. This looks like the "hot ticket" to me. Cam advanced fourteen degrees, the equivalent of one tooth off. Things are starting to head downhill from here, if you need to spin a small propeller fast. This is what you'd get if you RETARDED the cam by exactly one tooth. Much lower torque AND power. The conclusions that I draw from the above plots are that something like 4 to 10 degrees of cam advance is perfect for MY engine at the RPMs I plan to run (cruise at 3400 or so). Not only is hp and torque higher than with no advance, volumetric efficiency improves from 78.2 percent to 84.7 percent (at 10 degrees). Now the question is, what is the downside? Obviously top end suffers, but we direct drive airplane guys don't care one bit about that, because we'll never get there. The OT-10 cam tag says that "for most applications the cam is run at 2 to 6 degrees advanced". That tells me that I'm on the right track, and that there's nothing wrong with going with 8 or 10 degrees of advance, if my application requires a strong bottom end. It also tells me that for airplane guys, one of those nifty offset woodroof keys good for 4 degrees of advance is certainly a step in the right direction. And if somebody told me I could gain 2% more torque by simply installing a $17 offset key between cam and gear, I'd be all over it. I degreed my cam to see what it really was in MY installation, and determined that my cam is advanced 6 degrees. This is fantastic news, since if I had the choice I'd either advance it 4 or 6 degrees! Below is the cam tag for the OT-10 cam. Anybody ever notice how the lift figures are reversed between the specs to the left and the plot on the right? This worried me a bit, until I ran it through Dyno2000 and ascertained that it really didn't make much difference which one was which. Max difference was either one hp or one lb-ft of torque at 3500 rpm. Everything below this line is stuff that I stole from the web and pasted in to help ya'll understand what's going on in the above charts. A. LOBE PROFILE - The contour of the cam lobe which determines how far above the base circle a lifter is moved and for how long it is held off the base circle. C. CAM LIFT - The maximum distance the cam profile will raise the lifter above the base circle. F. DURATION - Duration is the total angle in CRANKSHAFT degrees that a valve is open. Duration determines where the power range will be for a cam. Increase the duration and the power range will move up in RPM and you will lose low end power. DECREASE the duration and the power range will move down in RPM and you will lose high end power. What you gain on one end, you will lose on the other. To be useful, duration specifications must reference a lifter or valve lift. Advertised and .050" duration are the most popular durations used by camshaft manufacturers. G. .050" DURATION - .050" duration is measured in CRANKSHAFT degrees from the point where the lifter rises .050" from the base circle on the opening side of the cam lobe to the point on the closing side of the lobe where the lifter drops to .050" from the base circle. The .050" duration is todays most common standard for measuring duration. H. ADVERTISED DURATION - The point of measurement for advertised duration can occur at any lift above the base circle. The lower the point of measurement for lift, the higher the duration angle. This specification is provided for people who think more is better. Advertised duration is a duration stated by a cam manufacturer as a reference to their camshaft only. Advertised duration has no lift specification point agreed to among cam manufacturers. The same manufacturer may use different lift points on different camshaft profiles to list advertised duration. There is no rhyme or reason to advertised duration among cam manufacturers. I. LOBE CENTERLINE - An imaginary line that goes from the center of the base circle through the point of maximum lift on a lobe. J. INTAKE LOBE CENTERLINE - The number of CRANKSHAFT degrees from TDC (with the lifter in the middle of overlap) to the intake lobe centerline. K. EXHAUST LOBE CENTERLINE - The number of CRANKSHAFT degrees from TDC (with the lifter in the middle of overlap) to the exhaust lobe centerline. L. OVERLAP - Overlap is the angle in CRANKSHAFT degrees when both intake and exhaust valves are open at the same time. This is at the end of the exhaust stroke and the beginning of the intake stroke. INCREASING the duration will usually increase the overlap. Overlap must be specified at a lifter or valve lift value. N. CAM ADVANCE - To calculate cam advance you subtract the Intake Lobe Centerline from the Exhaust Lobe Centerline and divide by two. If you have a plus number then the cam is advanced, if there is a minus number then the cam is retarded. (ELC 117 - ILC 107 = 10 divided by 2 = 5, this cam is 5 degrees advanced). The four stroke engine is the backbone of the automotive and racing industries. Yet the basic scientific concepts of volumetric efficiency, thermal efficiency and mechanical efficiency and how they relate to engine performance is not well known. It is pretty common knowledge among "car guys" that the pistons move up and down in the cylinders and that the valves open and close to create cycles. The four strokes (or cycles) that the engine uses are also common knowledge to car guys. This page provides you with the fundamentals of engine science and will take some of the mystery out of making more horsepower with a four stroke engine. An engine is just a machine that converts fuel energy to a rotating motion, which is commonly measured as horsepower. In the engine, gasoline is added to the air as it passes through the carburetor (or fuel injectors) on its way to the cylinder. This mixture is then burned in the cylinder, creating heat which creates pressure. This pressure pushes the piston down in the cylinder to turn the crank shaft. Now, to the science part. Fuel has a chemical energy. A typical pound of gasoline contains 19,000 to 20,000 Btu. Just like 12 inches equals one foot, it is given that 2,545 Btu per hour = 1 horsepower. Therefore, the power output is directly related to how much fuel the engine can effectively burn. Now, don't run out and put bigger jets in you carb trying to make more power. If the fuel/air mixture is too rich it won't burn properly and you will make less power. A better way to think about this relationship is that a larger engine would pull more air and fuel into the cylinders; therefore, a larger engine would make more power. Also, super charging or turbo charging packs more fuel and air into the cylinders, so this would also make more power. Imagine that you have a 100 cubic inch single cylinder engine. On the intake stroke, the piston moves to the bottom of the cylinder and creates a volume that is 100 cubic inches. The fuel/air mixture that fills this volume is what will be used to create the power. Now imagine that this engine has some type of restricted intake, such as a small carburetor or restrictor plate like they use in NASCAR. With this configuration, the intake manifold has a fairly good vacuum. In this case, even though the piston pulls a volume of 100 cubic inches into the cylinder, it is not atmospheric air. Here, you have the 100 cubic inches of the vacuum from the manifold. You can think of this as the opposite of super charging because the cylinder ended up with less fuel and air molecules rather than having more fuel/air packed into the same volume. Volumetric efficiency (VE) is used to describe the amount of fuel/air in the cylinder in relation to regular atmospheric air. If the cylinder is filled with fuel/air at atmospheric pressure, then the engine is said to have 100% volumetric efficiency. On the other hand, super chargers and turbo chargers increase the pressure entering the cylinder, giving the engine a volumetric efficiency greater than 100%. However, if the cylinder is pulling in a vacuum, then the engine has less than 100% volumetric efficiency. Normally aspirated engines typically run anywhere between 80% and 100% VE. So now, when you read that a certain manifold and cam combination tested out to have a 95% VE, you will know that the higher the number, the more power the engine can produce. Basically, volumetric efficiency is effected by your carb, intake manifold, headers, and cam specs. All of these items effect how much fuel/air will flow into the cylinder. But remember, the more fuel/air that gets into the cylinder, the more power the engine will produce. This is where software programs such as Engine Analyzer Pro and Dynomation can be a big advantage. All of these programs calculate volumetric efficiency for different engine configurations that you enter into the software. This allows you to do your own testing without having to buy the parts until you get the right combination. Getting more fuel/air into the cylinder means more fuel energy is available to make power. Unfortunately, not all of the fuel's energy gets converted to rotating energy. Of the 19,000 to 20,000 Btu per pound of gasoline, typically less than 1/3 ends up as useable horsepower. Compression ratio, ignition timing, thermal coatings, plug location and chamber design all affect the thermal efficiency (TE). Low compression street engines (smog motors) may have a TE of approximately 0.26. A racing engine may have a TE of approximately 0.34. Because these numbers are relatively small, at first glance there may not seem to be much difference between the street engine and the racing engine. However, when you grind out the math (.34 - .26 / .26), the racing engine produces about 30% more power because of the higher TE. Finding little improvements to the TE can end up as a significant improvement to the final horsepower that the engine produces. Using the Engine Analyzer Pro software, you can try different compression ratios, coatings, etc. on your computer and see what happens to the thermal efficiency. Volumetric efficiency identifies how much fuel/air gets into the cylinder and thermal efficiency identifies how much of the fuel gets converted to useable power, but some of this power is robbed by the engine's moving parts. It takes power to overcome the friction between parts and to run engine accessories such as the water pump. So, depending on how much fuel gets into the cylinder and depending on how much of the fuel gets converted to workable power, some of this power is used by the engine to run itself. The left over power is what you would measure on a dynamometer. The difference between what you would measure on the dyno and the workable power in the cylinder is the mechanical efficiency (ME). Mechanical efficiency is effected by rocker friction, bearing friction, piston skirt area, and other moving parts, but it is also dependent on the engine's RPM. The greater the RPM, the more power it takes to turn the engine. This means the faster the engine runs the more the ME drops. Often times the ME is expressed in terms of friction horsepower. Or in other words, how much horsepower is needed just to overcome the friction. This is where computer programs like Engine Analyzer and Engine Analyzer Pro are fun to use because you can try different engine combinations in the software and see how much friction HP the combination creates. Return to Mark Langford's CorvAircraft engine.